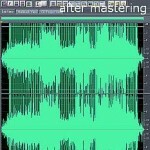 Tags: Audio CD production, Loudness in audio mastering. The yellow boxes in the flow chart are important and required. The gray boxes are optional and only used when necessary. It is called “digital audio mastering” because everything is done inside a computer using mastering software. This tutorial will be using Adobe Audition, although the process is well applicable to other software as well with similar plug-in and effects. Everything will start on the mix down material. This is the product of the audio mixing process where the entire tracks are summed up into a single waveform known as the “mix down”. 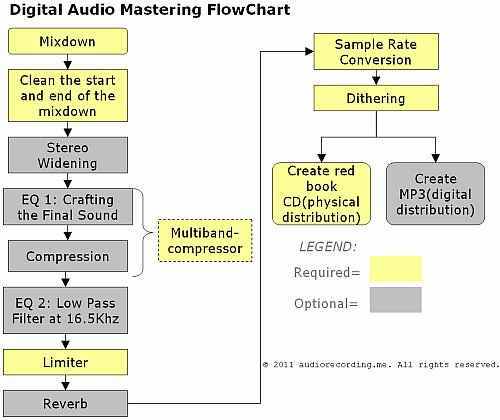 Technical format for mix down should be as high resolution as possible such as 24 bit/96Khz. 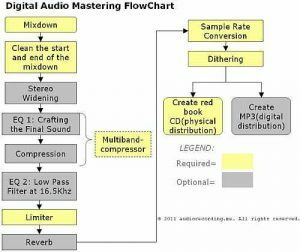 I have written some guide on the detailed technical requirements of your audio mix down for mastering. a.) 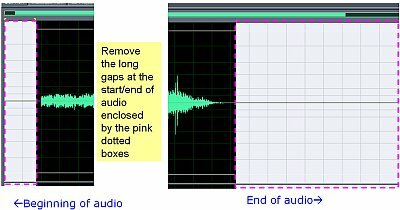 The bass needs compression to accomplish the desired tightness/punch. If you apply only a specific compression setting affecting only the bass frequencies using a MB compressor, it won’t affect the dynamics of other bands (e.g. the mid and high frequencies). b.) Maintain a good tonal balance overall while doing compression. It is because you can also adjust the gain of each band. 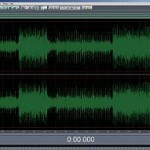 Tips in Mastering Audio at Home!